It’s 7pm and the sun is setting over Kit Carson Amphitheater. 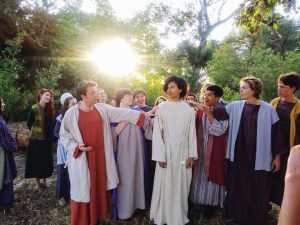 Most people would be headed home long since at this hour, but not the cast of Patio Playhouse’s Jesus Christ Superstar. In truth, our night is just beginning; with opening night less than two weeks away, there is lots to be done… but we are determined. In front of the stage, one can see cast members stretching, warming up, and reviewing parts and choreography waiting for the call to places. Director Deborah Zimmer calls places for Act One and we’re off on another run-through, another chance to get it right. I remember a few short weeks ago when it seemed like we’d never get here and yet everything is coming together. It’s amazing how far we’ve come from our first music rehearsal to this moment. Marching ever forward an as army of 47, singing, dancing and sometimes crying our way through the difficult subject of the crucifixion with grace and grit, we continue. It’s the jokes that bolster us. This cast has a wicked sense of humor and, while we are all very serious about the story we are telling, a sense of merriment pervades between scenes. One can also feel the excitement rising, as every rehearsal is one step closer to opening night. We will be ready. As we move through the numbers, we grow more confident and unified as a team, actors make new discoveries in their characters, and details become more refined. Being “the crowd” does present its own acting challenges; without the underpinnings of dialogue, one must act and react appropriately, improvising all interactions and, sometimes, just be still but engaged. It’s a delicate balance to be visibly invisible, one that is significantly helped by the sheer number of talented actors in this cast. Acting is easy when there is genuinely so much to react to. Deborah gives notes at the end of rehearsal; after all, there is always something that can be improved upon. The sun has long since set and we sit in the flood lights of the amphitheater. When she is finished, we are dismissed… usually around 10pm. We leave with the knowledge that we’ll do it all again tomorrow, many of us with full work or school days ahead of us. It truly is a labor of love. With an outstanding cast of principles anchored by our massive and massively talented ensemble, we are poised to create a theatrical experience of truly biblical proportions. We do hope you’ll join us at the show between June 15-30 (Thurs-Sun) at 8pm to enjoy the fruits of our labor. Tickets are on sale now!